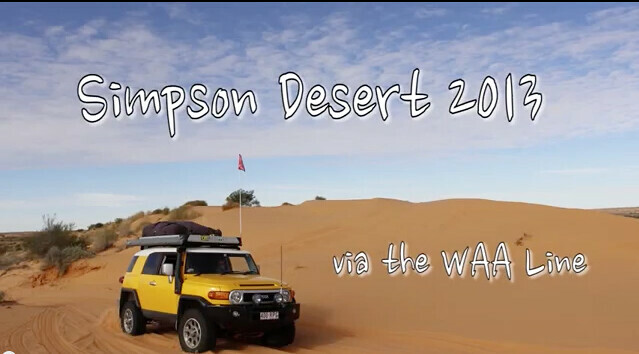 In June 2013, my daughter and I embarked on an adventure to cross the Simpson Desert via the WAA Line driving east to west. It is a great track due to the fact of no trailers, not many people and the best driving you are likely to do in a 4wd. Great video Gaz, thanks for sharing. We did the section of the WAA line between the Colson & Erabena tracks in 2012. It certainly is a lot quieter down there when compared to the French Line, which just adds to the isolation and experience, in a positive way of course! Haha classic sound track, Great flik. Would love to give it a crack from WA to QLD one day. Awesome video guys what a trip you guys make a great team. That was a great video indeed. Very inspiring that a video like that which once would have required heaps of expensive specialist gear can be done by anyone who puts their mind to it. Enjoyed it heaps! I keep wanting to do something like that but just am not that organised..
We did a very similar run in 2010 but it was much greener and wetter back then.. can't wait until the next time I can do a full crossing or better still spend a week or two in the Desert just wandering around some of the tracks and just sitting back enjoying the serenity. I'm more impressed at the fact your daughter appears to be reading from some weird contraption made from ink and paper and not off the screen of a tablet like most "books" are coming out these days! Fun video and looks like a great time to be had, hope to do a simpson crossing myself one day!! Thanks for taking the time and effort to share that Gaz. Really cool that you daughter went with you, I have 3 but a lot younger (4,3&7mths) and I envision doing those sort of trips when they are a bit older, we frequently camp and 4wd (did Rainbow Beach yesterday) however that was a really cool adventure you shared. Well done to you both. I am sick of people having a shot at camper trailers I have towed my trailer through almost every desert in OZ and have NEVER got into difficulties I run my Truck tyres at 16psi and the trailer at 12. I do less damage than the mug with a slidon camper that refused to drop his tyrers below 40psi and a few other richard cranium's that were running full pressure, At some stage in life you get a bit to beyond the swag thing , I did the swag thing for over 30 years now its time for a bit more comfort. I was pulling trailers across the desert years before they were a popular thing ,Back in the late 70's I was part of a drilling crew that pulled two 40' trailer each across unexplored desert and the drilling crew pulled bogie trailers behind old Blitz wagons and series 1 land rovers and 4x4 Austin trucks. If you aproch it wright there is no issues with trailers. Sorry to hijack your thread but Rant over.